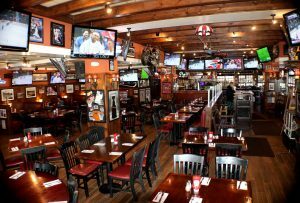 THE MAIN EVENT Restaurant & Sports Bar at Plainview is a cozy sports-themed restaurant with 50 flat screens, and an extensive menu of handcrafted ales and microbrews for all tastes. Our seafood is always fresh and our steaks are cooked to perfection. Stop in and watch the games in our family friendly environment. We have a great space for sports. Enjoy our comfortable seating, whether at the bar or at our tables. We have draft beer and a full kitchen. We carry all DIRECT TV sports packages. Feel free to book your reservation by calling (516)935-5120 or just walk in. Restaurant & Sports Bar Experience! We carry all DIRECT TV and UFC sports packages. Feel free to book your reservation by calling 516.935.5120 or just walk in.